A Slovenian agency has turned litter into a usable font. 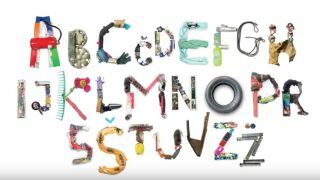 To mark World Cleanup Day earlier this month, Futura DDB has turned rubbish into art. The studio worked with Ecologists Without Borders and a group of volunteers to gather rubbish found in the fields and streets of Slovenia. They then turned their findings – from drinks cans and batteries, to bottles, tires, helmets, clothing and furniture – into letters. The images were vectorised and will be made available as a free font. Designers will be able to use what the team call ‘the cleanest font in the world’ in its original, full-colour format, or as a silhouette variant. Granted, it might not be your most widely-used font, but Futura DDB suggests it could be useful for NGOs or any individuals hoping to raise awareness of littering problems. Take a look at how the font was made in the film below.